The public debate in New Zealand might convince the casual reader that all the science related to fluoride revolves around tooth decay and IQ. But that is certainly not the case on a world scale. The World Health Organisation gives guidelines for the concentration of fluoride in drinking water recommending it should be in the range 0.5 – 1.5 mg/L. OK, above 0.5 mg/L because of the positive effect it has on oral health, in reducing dental decay. That interests us in New Zealand because our drinking water is more likely to be deficient in fluoride. But on the world scale, many people are far more interest in the higher limit – or at least in attempting to reduce their drinking water fluoride concentration to below this limit. This is because large areas of the world suffer from the health effects of endemic fluorosis due to the excessive dietary intake of fluoride and the high concentration in their drinking water. There are significant health effects from endemic fluorosis – effects we don’t’ have here but are important to many countries. So there is plenty of research – both on the health effects and on reducing drinking water concentrations and dietary intake. In fact, the anti-fluoride campaigners get all the scientific reports they use in “evidence” to oppose community water fluoridation from studies in countries where fluorosis is endemic. Not only is this misrepresenting the science. It is also unbalanced because scientific studies on IQ in areas of endemic fluorosis represent only a small proportion of such health-related studies. To illustrate this I have done a number of searches on Google Scholar using the terms “endemic fluorosis” and one other term related to a health effect. Here is the resulting table. 40% of the hits related to “dental fluorosis” and another 40% to “bone” while 33% related to “skeletal “fluorosis.” Obviously, these are of big concern in areas of endemic fluorosis so receive a lot of research attention. In fact, the prevalence of these is used to define an area as endemic. But only 5% of hits related to IQ – clearly of much less concern to researchers. Yet it seems to be all we hear about here and this illustrates how unbalanced most of the media reports we get here are. To start with, these health effects do not occur in countries like New Zealand using community water fluoridation. They occur in regions where drinking water contains excessive fluoride and where the dietary intake of fluoride is excessive. 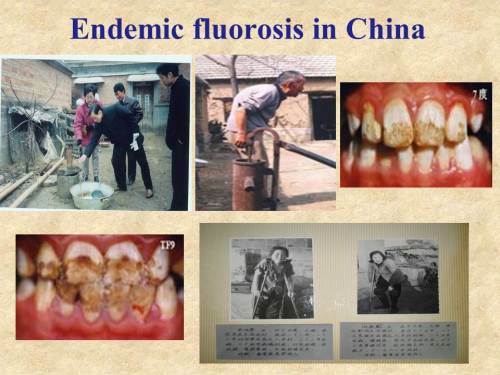 Much of the anti-fluoridation propaganda used by activists rely on studies done in areas of endemic fluorosis. Slide from a presentation by Q. Xiang to an anti-fluoride meeting organised by Paul Connett’s Fluoride Action Network in 2014. But the other fact is that IQ effects receive relatively little attention in health studies from those areas compared with the more obvious, and more crippling, effects like dental and skeletal fluorosis. Mind you, that doesn’t stop activists making sporadic claims of all sorts of health effects from fluoridation and relying on studies from areas of endemic fluorosis. But the most frequent claims made by activists at the moment relate to IQ. Perhaps this is because it is harder to hide the fact that we don’t see cases fo skeletal fluorosis or severe dental fluorosis in New Zealand. IQ changes are not so obvious and this might make them a more useful tool for anti-fluoride campaigners to use in their scaremongering.